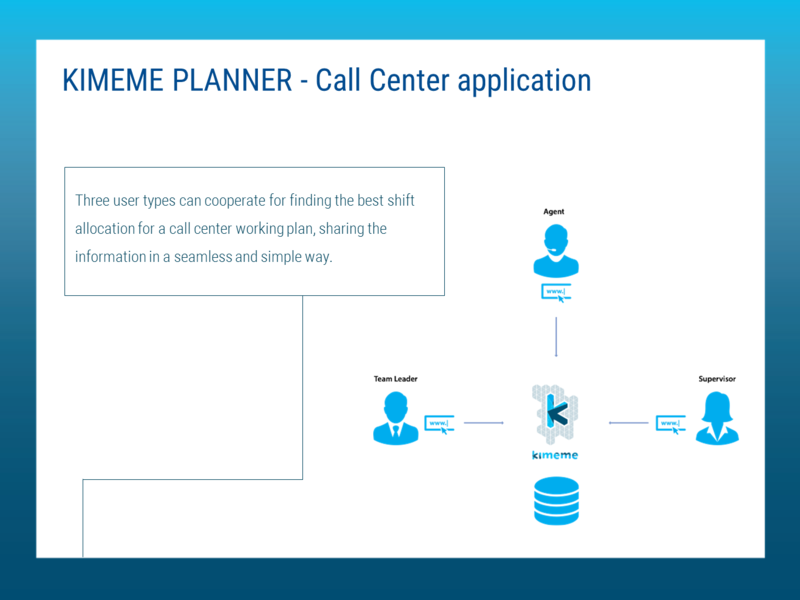 Automation, Optimization and Efficiency are the three milestones of KIMEME PLANNER, the application that automates the entire workforce management or production planning, using sophisticated algorithms that take into account all kid of constrains as production capacity, skills, contracts, custom calendars and many others. Thanks to a simple multi-skill and multi-channel planning approach, KIMEME PLANNER finds quickly, among countless possibilities, the best solutions in terms of coverage of the workload, constrains feasibility and maximum efficiency. It is hosted on a very efficient cloud computing environment. All key variables are supervised and optimized by KIMEME. The created data are automatically generate and can be analyzed with ease. The optimization process is automatic and it can deliver real time results to the planning team. Users can cooperate at finding the best working plan, sharing the information in a seamless and simple way. You can scale up or down the optimization infrastructure according to your needs. 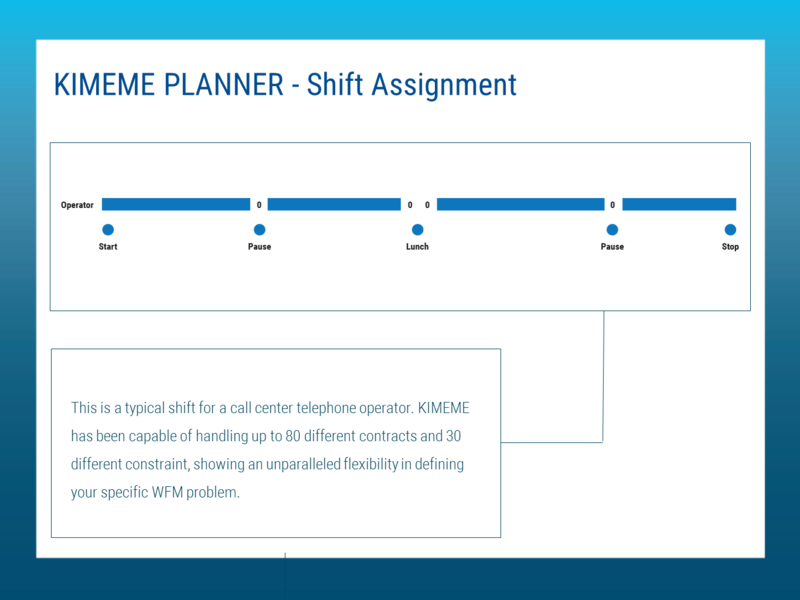 KIMEME is capable of handling up to thirty thousand operators, hundreds of contracts and constraints, showing an unparalleled flexibility in defining your specific planning problem. The service in the Cloud saves on hardware resources and maintenance costs. The solution is also available on a fee pay-per-use scalable model. For each euro payed to Cyber Dyne, an average of nine euros are saved by optimizing the delivered production schedule. Make multi-seat, multi-task, multi-line schedules for call center. 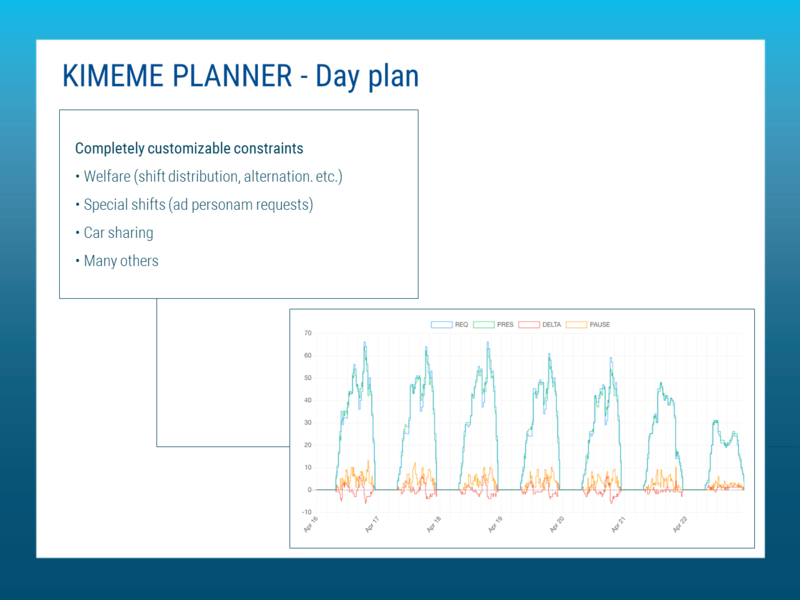 Customizable constraints, divided into “hard – medium – soft” (e.g., seat limits, minimum separation between consecutive shifts, free Sunday/free weekend distribution, fair distribution of morning/afternoon/evening shift, weekly alternation, shift homogeneity, and many more). Car-sharing support and scheduling optimization of agents traveling together. Overtime, vacations and permits optimization. All of these features are easily extensible.